Our mobile device management solution is now available in Univention App Center. That means companies of Univention Corporate Server has now a software for the secure integration of mobile devices. 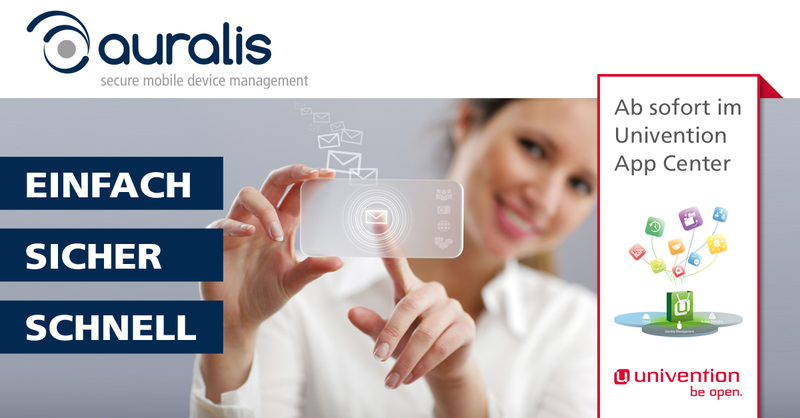 Auralis is preconfigured and with just a few clicks immediately ready for use. So the open source provider Univention won with auralis a MDM solution from a German manufacturer for its platform. The software solution has been adapted for the Univention platform and pre-configured to be ready for immediate use on the Univention App Center with a few clicks. Thanks to the SSL-based authorization of devices, a built-in Certification Authority (CA) and strongly encrypted SSL connections, users can securely access e-mail, calendar, contacts, and tasks of your ActiveSync-compatible groupware. In addition, by the unique e-mail compression, auralis saving up to 90% of the transmission attachment volume. Attractive is also the licensing model of the manufacturer Thinking Objects: With only one license per user and not per device, which significantly reduces costs compared to other enterprise vendors. Companies can test the software for 30 days free of charge.